Adopt a Double Dog Today! Our adoption fee is $485. Due to rising costs, our fee has been slightly raised in order to cover the cost of both vetting and transporting our dogs. We use professional transports to ensure the safety of all of our dogs. You will receive the vet records at the transportation pick-up. Remember, your adoption fee is tax-deductible at the end of the year. Click here to download our application. We have a very specific contract that is tailored for families with children. If you have children under the age of ten who live with you and/or visit, you will be asked to submit this contract before you can be approved to adopt. As the adult(s) in the home it is your full responsibility to educate your child(ren) on the proper way to interact with your dog, and vice versa. 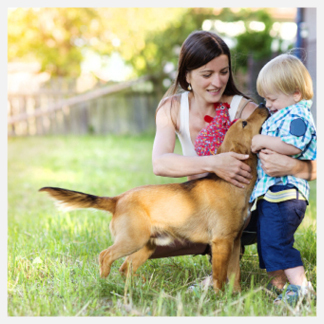 We want your guarantee that you will introduce and educate your children (and their friends as well) as to how to properly and safely interact with your dog, creating respect and boundaries for both. Children and dogs should never be left together unattended. It only takes a moment for a dog to get accidentally hurt or startled and for that dog to react. We encourage you to watch this video with your entire family before you consider adopting. 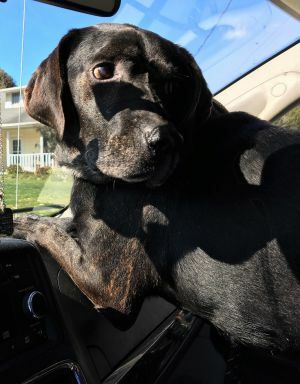 Breed: Terrier/Plott Hound mix Age: 8 months old Weight: 40 lbs. Good with dogs: No Good with cats: Yes Good with kids: Yes Energy Level: High Available for Adoption: Now (Currently accepting applications) Your application must be approved prior to meeting any dog. You can stop your search here if you are looking for the perfect family dog who is energetic, yet well-mannered, and absolutely adorable! 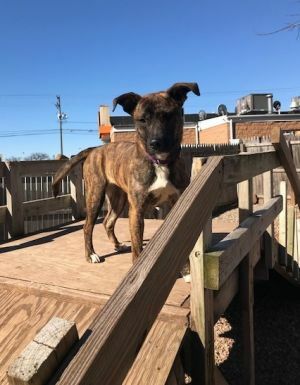 Avril is a young Terrier and Plott Hound mix who is as loving as they come! She adores her people and will follow you to the ends of the Earth. She would prefer to have a home all to herself where she can get all the attention! Playtime is the best time according to Avril! She enjoys chasing tennis balls and looks forward to Spring and Summer when she can chase them for hours in the backyard without all this pesky snow. Avril still very much enjoys staying active and she likes to get her daily exercise in by going on walks and hikes. Meet Avril and you will immediately know that she is the one for you! If you would like more information on Avril, please contact Wendy at DoubleDogWendy@gmail.com. 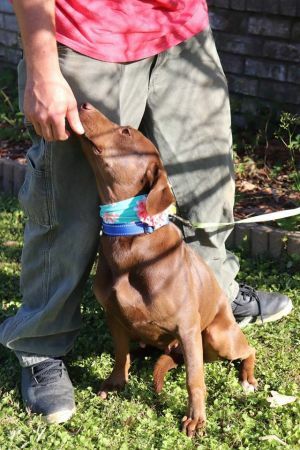 Breed: Labrador/Terrier mix Age: 2 years old Weight: 52 lbs. Good with dogs: Yes Good with cats: Yes Good with kids: Yes Energy Level: Medium-High Available for Adoption: 4-27-19 (Currently accepting applications) Your application must be approved prior to meeting any dog. Meet Babe! She is a mix of Lab and Terrier and is around 2 years old. Babe gets along well with everyone! She enjoys the company of other dogs and will play for a while with them, but not for extended periods of time. She needs her rest after all! Babe is super sweet and very friendly. She loves attention and affection from anyone! Fetch is her favorite game so she would appreciate a yard to play in. She would be a great fit for a single owner, a couple who is ready for their first dog, or a large family with kids! Whoever her forever family is, all Babe hopes is that they love her as much as she loves them! If you would like more information on Babe, please contact Tracy at TracyDoubleDog@gmail.com. 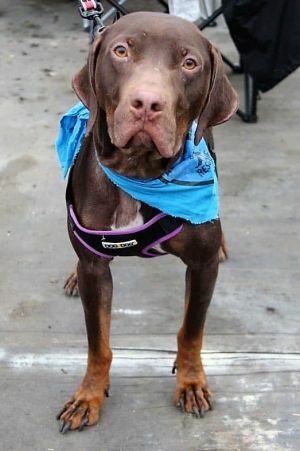 Breed: Shepherd/Weimaraner mix Age: 2 years old Weight: 45 lbs. Good with dogs: Yes Good with cats: Yes Good with kids: Yes Energy Level: Medium-High Available for Adoption: 4-13-19 (Currently accepting applications) Your application must be approved prior to meeting any dog. Meet Baxter! He is a 2-year-old handsome young boy with the most unique coat! Baxter is friendly with all, though a bit shy during the first couple minutes of new introductions. Once he opens up, he is an energetic and happy pup! He loves to play with his doggy friends, so he would love to have a four-legged sibling, but it is not required. If you are looking for a companion who will always be ready for a walk, a run, or a hike - Baxter is your guy! He is incredibly sweet and will have the best time greeting everyone he passes during your outdoor adventures. He is excited to find his forever family! If you would like more information on Baxter, please contact Tracy at TracyDoubleDog@gmail.com. 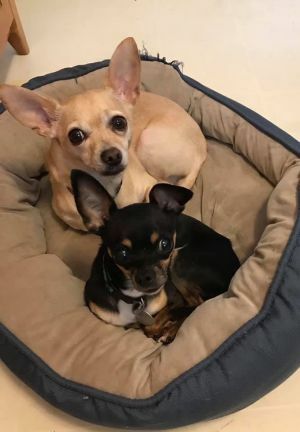 Breed: Chihuahuas Age: Both 4 years old Weight: Bella 4lbs/Chance 13lbs Good with dogs: Yes Good with cats: Not Tested Good with kids: Older Energy Level: Low Available for Adoption: 3-30-19 (Currently accepting applications) Your application must be approved prior to meeting any dog. Meet Bella and Chance! They are two inseparable little Chihuahuas who are looking for their forever home...together! Bella is a 4-year-old sweetheart who is looking for a quiet and calm household. She is blind and enjoys having Chance by her side. Her lack of sight comes with just a little bit of nervousness, as expected, so she is looking for a home without young children who may shuffle by her too fast and frighten her. Once she knows you, she will cuddle up with you and want to be on your lap as much as possible! She LOVES to be held! Chance is also a 4-year-old Chihuahua who is fairly timid and would prefer a home without loud noises or young children. Like Bella, Chance is an excellent cuddler and once he gets comfortable with his new family and new home, he will be your little shadow! If you would like more information on Bella and Chance, please contact Michelle at MichelleDoubleDog@gmail.com. 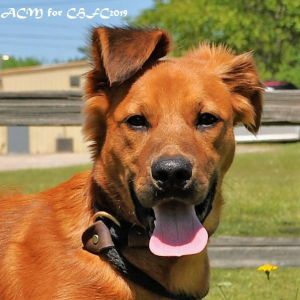 Breed: Retriever mix Age: 1 year old Weight: 35 lbs. Good with dogs: Yes Good with cats: Yes Good with kids: Yes Energy Level: Medium Available for Adoption: Now (Currently accepting applications) Your application must be approved prior to meeting any dog. Meet Blondie! She is a beautiful pup who is just a year old! Blondie enjoys the company of people but is very shy at first. She quickly gains more confidence when around other dogs, which is why we are requiring that she share her home with a four-legged sibling! Blondie also requires a fenced-in yard, as she is easily spooked and could be at risk to take off if ever loose in a non-enclosed area. Once she gets comfortable, she clearly shows how much she loves you. However, this process is going to take lots of time, patience, and TLC from her new family. 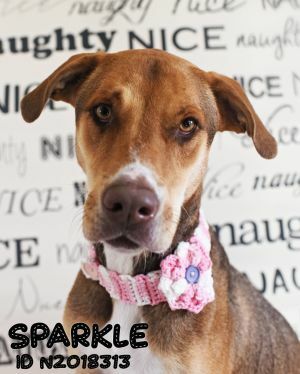 She would do best in a quiet home with minimal commotion. Squeaky toys are her favorite, but she does not care too much for tennis balls. Perhaps her new family can teach her how to appreciate fetch! She is ready to find her forever home! If you would like more information on Blondie, please contact Debbie at DebbieDoubledog@gmail.com. 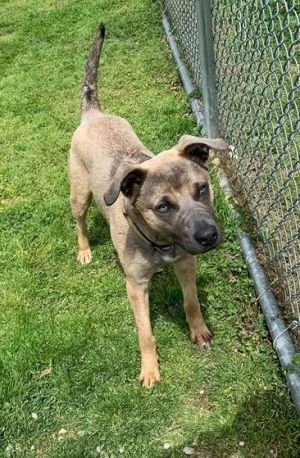 Breed: Great Dane/Labrador mix Age: 1 year old Weight: 75 lbs. Good with dogs: Yes Good with cats: Not Tested Good with kids: Yes Energy Level: Medium Available for Adoption: Now (Currently accepting applications) Your application must be approved prior to meeting any dog. Meet Calvin! He was found as a walking skeleton and was practically nothing but skin and bones. Today, you would never know that he was treated so poorly, as Calvin loves people and has not lost his trust in them. 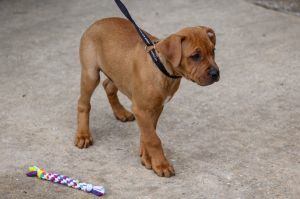 He is a fantastic boy with the best temperament and is excellent with other dogs. Calvin LOVES love!! So much so that he gets a little excited when showing affection. His excitement, mixed with his large size and his young age, makes one goofy boy who may accidentally knock over some youngsters while trying to be affectionate. Therefore, parents of little ones should be mindful of this. 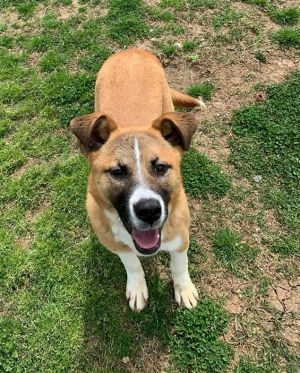 Calvin has gained an appropriate amount of weight thus far, but his future family should be prepared to have him gain some more and should follow the recommendations given by their vet. This laid-back sweetheart is more than ready to find a forever family who will love and care for him. In return, he will give you plenty of love and puppy kisses! If you would like more information on Calvin, please contact Michelle at MichelleDoubleDog@gmail.com. Breed: Yellow Labrador Retriever Age: 8 years old Weight: 60 lbs. Good with dogs: Yes Good with cats: Yes Good with kids: Older Energy Level: Low Available for Adoption: Now (Currently accepting applications) Your application must be approved prior to meeting any dog. Meet Casper! This sweet senior is looking for a quiet home where he can relax and enjoy the company of his new family in peace. 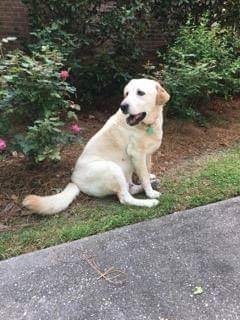 Casper is a Yellow Lab and is 8 years young. He is great with other dogs and is even good with cats! 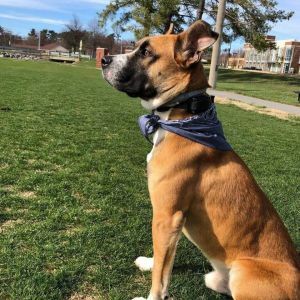 He is no longer at the point in his life where he will want to run miles, fetch for hours, or do any strenuous physical activities such as hiking or agility, but is rather at the point where he is ready to live life in the slow lane. His ideal family would be home most of the day to spend time with him and will appreciate some downtime. Casper loves to be around people and hopes that his family likes to give belly rubs and go for leisurely walks. Whether his new family is a senior couple, a bachelor who works from home, or a pair of empty-nesters, all Casper cares about is finding a calm home where he will be loved! If you would like more information on Casper, please contact Wendy at DoubleDogWendy@gmail.com. 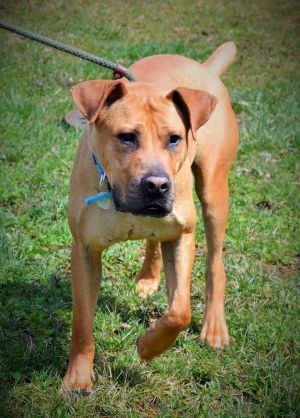 Breed: Boxer/Shepherd mix Age: 2 years old Weight: 65 lbs. Good with dogs: Yes Good with cats: Yes Good with kids: Yes Energy Level: High Available for Adoption: Now (Currently accepting applications) Your application must be approved prior to meeting any dog. Meet Cooper! This handsome boy is approximately 2 years old and is a Boxer mix! Cooper has a great medium energy level half of the time, while also being able to engage in playtime with high-energy dogs. He would love a doggy sibling, but would be just fine as an only dog as well. He has called cats family members in the past, so a home with dog-savvy kitties would be a great fit for him too! Cooper loves to be around people and socialize with everyone he meets! He is super lovable and sweet and deserves a family who appreciates his gentle heart! If you would like more information on Cooper, please contact Ashley at AshleyDoubleDog@gmail.com. 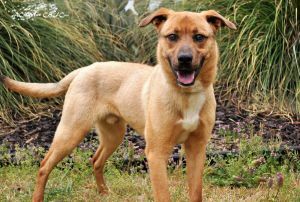 Breed: Shepherd mix Age: 2 years old Weight: 40 lbs. Good with dogs: Yes Good with cats: Not Tested Good with kids: Yes Energy Level: Medium Available for Adoption: 4-13-19 (Currently accepting applications) Your application must be approved prior to meeting any dog. Meet Finnegan! He is a handsome little guy who loves being around people! Finnegan enjoys attention wherever he can find it - on walks, at the park, or just whoever he comes across while running errands with you! He loves squeaky toys and hopes that his new family will spoil him with lots of them. 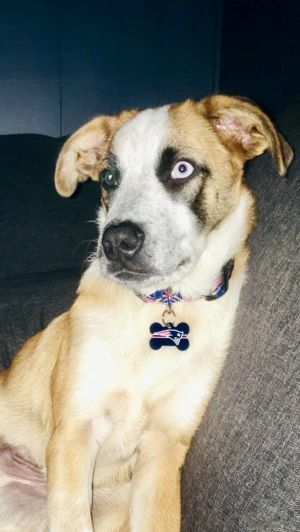 Finnegan does not know any basic commands yet, which is a great reason to enroll him in an obedience class that will not only teach him new things, but will allow him and his new family members to bond. Treats are his biggest weakness so that will surely come in handy come training time! 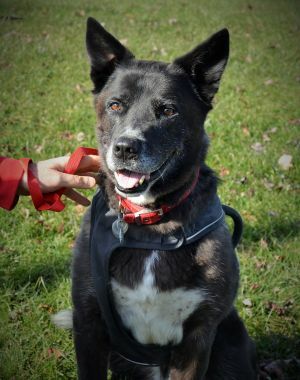 Finn is the perfect medium energy dog that would be a good addition to any family, such as a big family with kids, a senior adopter, or a young couple. His New Home Checklist consists of toys, treats, and LOVE! Can you provide all three? If you would like more information on Finnegan, please contact Scott at Love.My.Rescues71@gmail.com. Breed: Black Labrador mix Age: 7 - 8 years old Weight: 65 lbs. Good with dogs: Yes Good with cats: Yes Good with kids: Yes Energy Level: Medium Available for Adoption: Now (Currently accepting applications) Your application must be approved prior to meeting any dog. Meet Goofy! He is a super lovable boy who is around 8 years old! Goofy has a name that suits him well, as he is still as silly and playful as he most likely was as a pup! He is looking for a family who will provide him with daily exercise so he can get some energy out, as well as shed just a few pounds. His ideal home will have a fenced-in yard so he can run around and play, but most importantly - sunbathe! Goofy could spend hours soaking in the sun. In fact, that is exactly what he will do while everyone is away at work and school! He will find the window that is letting all the sunshine in and he will lay in it until it is time for him to get up and find some bones to chew on! At the end of the day, Goofy will want nothing more than to cuddle up with you on the couch and rest for the remainder of the evening. He is so happy to be able to start his search for a home! If you would like more information on Goofy, please contact Katherine at KatherineDoubleDog@gmail.com. 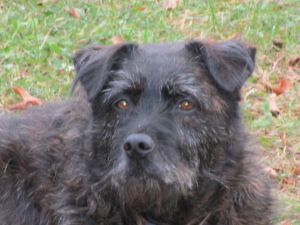 Breed: Wire-haired Terrier/Aussie Mix Age: 5 years old Weight: 70 lbs. Good with dogs: Yes Good with cats: Not tested Good with kids: Yes Energy Level: Low-Medium Meet Harlow. She has had quite the life so far and a very interesting past. Harlow was originally adopted in 2013. In the last few years she has spent her summers in national parks, greeting people and dogs who came to camp. Due to health-related issues of her previous owner, she is no longer able to keep her. But do not feel bad for Harlow. She is a water bowl half-full kind of girl. Whenever she looks up at you she looks like she is smiling. Her previous owner has affectionately nicknamed her Girlie because she is such a happy girl. She describes her as low key, well behaved, sweet, loving and gentle. She loves snow, does not bark unless it is important, and does not pull on leash. If you would like a happy go lucky dog who likes to travel and is up for adventure, Harlow may just what you are looking for. 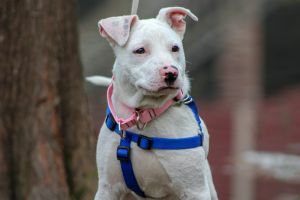 If you would like to adopt Harlow, please contact Michelle at michelledoubledog@gmail.com. 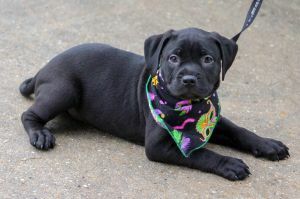 Breed: Black Labrador mix Age: 1 - 1.5 years old Weight: 60 lbs. Good with dogs: Yes Good with cats: Yes Good with kids: Yes Energy Level: High Available for Adoption: Now (Currently accepting applications) Your application must be approved prior to meeting any dog. Meet Luna! She is an energetic girl who LOVES to play! Luna is looking for a family who likes to be on the go as much as she does. She is hoping they enjoy going on frequent walks and hikes as well. She is just the sweetest not-so-little lady who will win over your heart the second you meet her. Luna would very much enjoy going to doggy day care if her new family is gone all day at work. 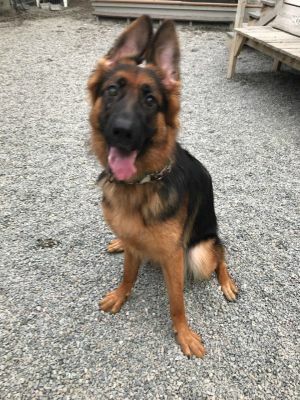 She would be quite sad sitting home all day without any company so she hopes to find a family who will be home enough to provide her with enough exercise if doggy day care is not in the cards. Her active, outgoing and loving family is out there somewhere! If you would like more information on Luna, please contact Katie at KatieDoubleDog@gmail.com. Breed: Great Pyrenees mix Age: 2 years old Weight: 85 lbs. Good with dogs: No Good with cats: No Good with kids: Yes Energy Level: Medium Available for Adoption: Now (Currently accepting applications) Your application must be approved prior to meeting any dog. Meet Maybelle! She is a stunning girl with a sweet demeanor and a lovely personality! Maybelle is one big girl, weighing in at 85lbs., but despite her size, she is as gentle as can be! 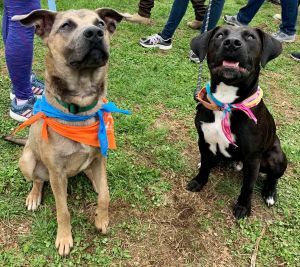 During the first few minutes of meeting, you will notice Maybelle is on the shy side and may keep her distance, which is very typical as being reserved is something her breed is known for. However, after a few minutes, she will warm up and will want to be pet and shown affection. Then after a few days, she will be running around the yard playing with her squeaky toys! 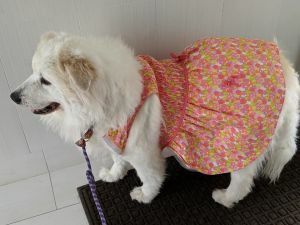 Her perfect family would be ready to show her lots of TLC while she settles into her new home, and would be somewhat experienced or at least familiar with her breed. Maybelle has many stereotypical Great Pyrenees traits, including being independent yet loyal. She is looking for a yard to play in that is fenced-in to keep her safe from wanting to explore too far. This sweet girl may have missed our last snowfall for the season, but she sure is looking forward to sunbathing when the weather gets warm! If you would like more information on Maybelle, please contact Debbie at DebbieDoubleDog@gmail.com. Breed: Terrier mix Age: 5 months old Weight: 25 lbs. Good with dogs: Yes Good with cats: Yes Good with kids: Yes Energy Level: Medium Available for Adoption: 4-13-19 (Currently accepting applications) Your application must be approved prior to meeting any dog. Meet Piglet! 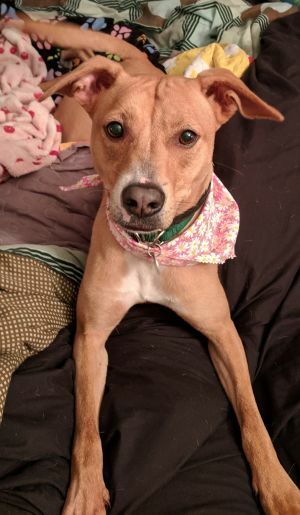 She is a Terrier mix and is currently 25lbs. and growing every day! Piglet is looking for a family who will not be gone long hours at work while she learns about potty training and basic obedience. She would do well in a home with another dog, a cat, or just by herself! Though just a little shy during first introductions, Piglet soon warms up and shows you her silly side! She was found wandering the streets with her brother, Tigger, at only a few months old. Now she is ready to find her forever family and cannot wait to play with them! If you would like more information on Piglet, please contact Dorothy at DorothyDoubleDog@gmail.com. 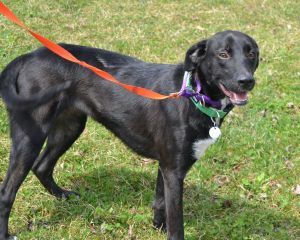 Breed: Black Labrador mix Age: 3 - 4 years old Weight: 55 lbs. Good with dogs: Yes Good with cats: Yes Good with kids: Yes Energy Level: Low-Medium Available for Adoption: Now (Currently accepting applications) Your application must be approved prior to meeting any dog. Meet Scout! He is an absolute gem and everyone who meets him falls in love with him right away! 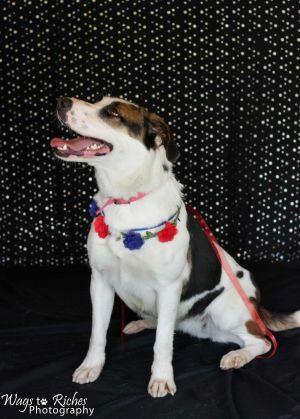 Scout is excellent with dogs, cats, and children. He is a very smart boy and knows his basic commands, including SIT, STAY, and SHAKE. This boy has wonderful manners which is no surprise since he has such a lovely personality. Scout is very calm, gentle, and laid-back. 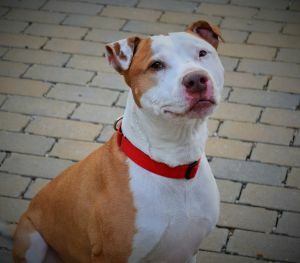 He enjoys the occasional brisk walk around the block, but that is about it, so his new family should not expect him to want to fetch for hours in the yard. What an amazing family dog he would be, but he does not mind whether he has a big family or just a single owner. All Scout cares about is finally being able to settle in his forever home with his new family! If you would like more information on Scout, please contact Michelle at MichelleDoubleDog@gmail.com. 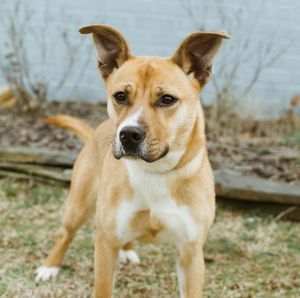 Breed: Carolina Dog mix Age: 1 - 2 years old Weight: 30 lbs. Good with dogs: Yes Good with cats: Not Tested Good with kids: Yes Energy Level: Medium Available for Adoption: Now (Currently accepting applications) Your application must be approved prior to meeting any dog. Meet Shelby! She is a sweet little girl who is looking for a home where she can have all the attention! Shelby plays well with other dogs but plays as Alpha and can be very dominant, so she will need a buddy who can handle such behavior. But do not think she needs a doggy sibling, because she does not! She would be more than happy to be the only child getting all the love and belly rubs for herself! 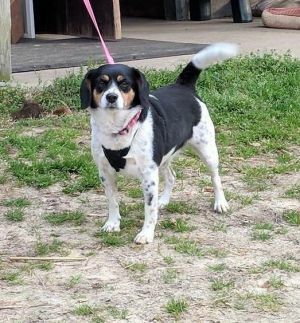 A home with a fenced-in yard would be excellent for her so she can sunbathe and roll around in the grass while you are gardening or tending to the lawn and would not have to worry about taking your eyes off of her for a few minutes. She is looking for a family who enjoys daily walks and will take her along on strolls through the neighborhood! Does Shelby sound like your perfect match? If you would like more information on Shelby, please contact Debbie at DebbieDoubleDog@gmail.com. 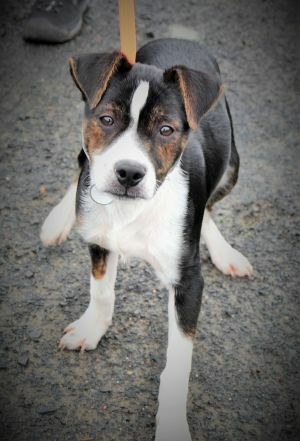 Breed: Terrier mix Age: 5 months old Weight: 25 lbs. Good with dogs: Yes Good with cats: Yes Good with kids: Yes Energy Level: High-Medium Available for Adoption: 4-13-19 (Currently accepting applications) Your application must be approved prior to meeting any dog. Meet Tigger! He has a typical puppy personality and is just as bouncy as the real Tigger! He is currently 25lbs. and growing every day! Tigger is looking for a family who will not be gone long hours at work while he is learning about potty training and basic obedience. He would do well in a home with another dog, a cat, or just by himself! Growing up with the kids of the family would not only be incredibly sweet, but would also be a great for him to get his energy out, as we are sure he would match the energy level of any young child during playtime! If you are looking for a silly puppy with a fun personality, you need to meet Tigger! If you would like more information on Tigger, please contact Katherine at KatherineDoubleDog@gmail.com.